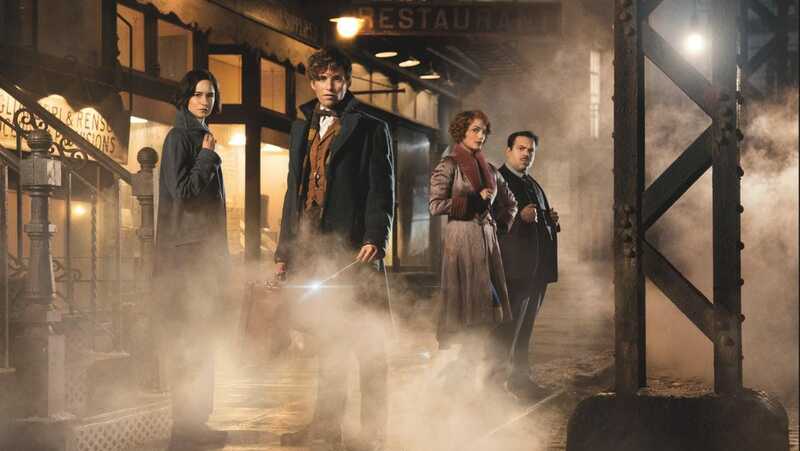 David Yates directs Eddie Redmayne, Katherine Waterston, Dan Fogler, Alison Sudol and Colin Farrell in Fantastic Beasts and Where to Find Them. In an original story by J K Rowling taking us back to world of witchcraft and wizardry that she created when she introduced us to the boy who lived. The story of Newt Scamander was a mere footnote in the story of Harry Potter and his 7 years of education at Hogwarts. Fantastic Beasts and Where to Find Them was the title of one of the textbooks Harry, Ron and Hermione studied. With this movie Rowling takes the world of wizardry outside of the confines of Hogwarts, there have been tantalising glimpses in the 7 novels but with Pottermore and now this 5 movie franchise the possibilities are potentially endless. Was that a book called “Casandra and her Cat Gustavo” that Kowalski was reading? Wasn’t Casandra the name of the Divination teacher Trelawney’s great-great-grandmother? Surely nothing in Ms Rowling’s world is coincidence. The story starts with our hero Newt landing in New York in the 1920s with a suitcase full of magical creatures. The creatures are let lose in the city and with the help of No-Maj (muggle to us potterheads) baker Kowalski, ex-aurorer Tina and her leglimense sister Queenie, Newt tries to capture them before they get in harm’s way. There are mentions of dark wizard Grindlewald terrorising Europe, growing tensions between the magical and non-magical folks of America and a mysterious dark force causing mayhem on the streets of New York. As with all her stories Rowling skilfully creates entire worlds in the most unusual of ways. 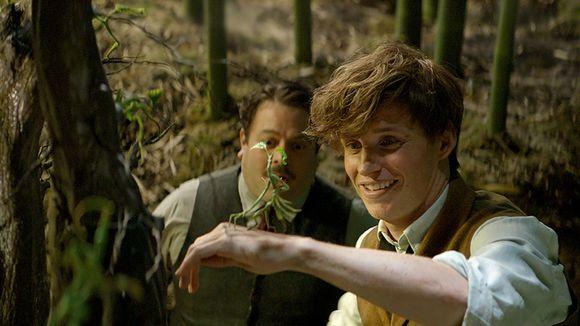 There is a veritable forest filled with magical creatures inside Newt’s suitcase, a ministry of magic with a very Gatsby-esque aesthetic, every character is intricately layered. Eddie Redmayne is quite the chameleon actor; he is shy and retiring like Einar from The Danish Girl when talking to his fellow humans and comes alive and is intelligent and compassionate in equal measure like Stephen Hawking from Theory of Everything when it comes to talking to his Beasts. Katherine Waterston is her father’s daughter and brings a Sam Waterston familiarity to her character she is earnest and likeable yet a bit skittish and jumpy. Alison Sudol brings the 1920s-glamorous oomph. Dan Fogler is fantastic as the No-Maj wannabe baker who ends up in the enchanting magical world and instead of being freaked out like most adults would do, he is wide eyed and precocious like a child. Ezra Miller brings back the creepy, devil child freakishness that he first burst onto the screens with, in We need to talk about Kevin. Samantha Morton plays Mary Lou a Umbridge like character who hates magic and Witches and Wizards and recruits the orphans in her care to keep an eye out on the suspicious magical activities in New York. Collin Farrell is fantastic, however I think he is potentially miscast as Director of Magical Security. I don’t want to reveal more secrets but I wish Farrell was cast in the Big Reveal character instead given that the subsequent films are going to feature that character prominently and an actor of Farrell’s age, and physical disposition is more suited to that character than the direction Yates went in. 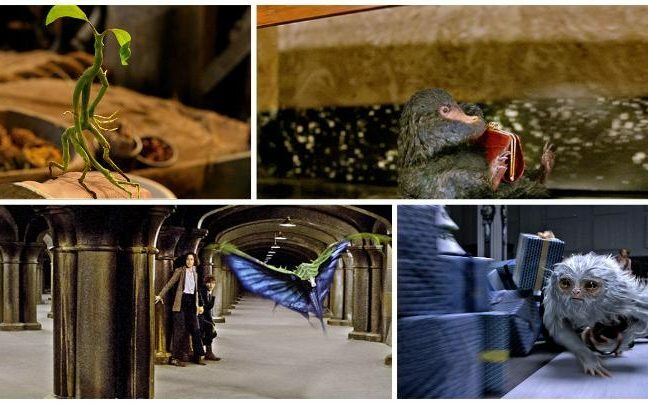 Rowling and Yates use Fantastic Beasts and Where to Find Them to setup the magical universe and in the process, take their time setting up things like giggle water, the blind pig speakeasy and the obscurius but by no means is the story any less impressive as a result. Like the very first time we hear Hagrid say “You’re a wizard Harry” the viewer, a Harry Potter devout (yours truly) or a newbie Redmayne enthusiast (the wife) walks away sufficiently mesmerized and entertained excited about the possibilities with the stories to be told. This however is not a children’s movie; this is decidedly dark and future stories will tell tales of malice the likes of which Dumbledore has locked away in his pensieve. The camera work by Philippe Rousselot is lush with sepia toned Newyork of the 1920s. Coleen Atwood’s costumes and the Production design and Sets are rich and layered and the next best thing to actually reading Ms Rowling’s writing. James Newton Howard provides an excellent accompanying soundtrack but I find the lack of a distinctive signature sound, like he did with Harry Potter which sounded like the wings of the snitch unfolding, a bit of a bummer. Ms Rowling is often credited with reviving the publishing industry when she brought the world of Hogwarts and Harry Potter to pages. With Fantastic Beasts, she may very well be responsible for saving Warner Bros studios that has gone in a terrible direction with Justice League with Snyder at the helm of that franchise. With her west-end play Harry Potter and the Cursed Child and now with this spin-off, she proves that there is a lot more magic still left in her to share with the world. She is the queen of storytelling and long may she reign! Tom Hooper directs Eddie Redmayne and Alicia Vikander in The Danish Girl, a story based on the pioneering life of Danish artist Einar Wegner who undergoes the first documented gender reassignment surgery to be transformed as Lili Elbe. Hooper is known for his sensitive direction of unusual subject matter and for extracting awards-worthy performances from his leads. With King’s Speech he got Colin Firth the lead actor gold as the stammering stuttering King George VI as he tries to overcome his childhood disabilities and lead Britain to war against Nazi Germany. With Les Miserables he directed Anne Hathaway to a supporting actor nod as she cried singed her way to Fantine’s epic I dreamed a dream. And here he directs last year’s winner Eddie Redmayne as he grapples with what it is to be a transgendered person in the 1920s and 1930s. But the real star is Alicia Vikander who as Einar’s wife and fellow artist Gerda Wegner brings to life the Lili that Einar has since childhood tried to keep under wraps. The first half of the movie where Einar and Gerda’s relationship is explored as husband and wife and his penchant for cross dressing and effeminate behaviour is slowly becoming more and more prominent seems a bit forced. Eddie Redmayne’s transformation from Einar to Lili seems conflict free and almost too sudden. But there is a beautiful moment when while spending time with Ben Wishaw’s Henrik Lili realises that Henrik is a homosexual who thinks he is spending time with Einar in a get up Lili leaves and a distinction is made between what it is to be a homosexual and what it is like to be a transgendered. It is the second half where the things get a little more fluid and things seem to flow with a natural ease. Through Lili Gerda loses her husband but finds the fame she has been chasing as an artist. Her portraits of Lili sell and she wins new commissions and is the toast of Paris art-scene. There is a beautiful struggle as she tries to hold on to Einar while it is Lili that is more and more on display. As Einar tries doctors after doctors who all treat him for various mental disorders you see the struggle is real for a transgender person in the 1930s. Finally through their friend Ulla played by a ravishing Amber Heard they come across a German doctor Warnekros who performs the pioneering operation. This is where Eddie Redmayne transforms and delivers stunning performance as Lili works at a shop and tries to learn the mannerisms that make up a flirtatious girl. The music by Alexandre Desplat is subtle as ever and underscores the silent struggles that both Einar/Lili and Gerda go through while Danny Cohen does spectacular work behind the camera to capture the stunning landscapes that Einar is known for painting and also the more personal portrait shots that are Gerda’s speciality. The scenes of the Fjords, the symmetrical shots of the Danish buildings the scenes at the wharf are all beautifully framed. The final scene of the scarf flying off at the cliff is made even more poignant because of the beautiful shot. While not perfect in execution, primarily due to a choppy first half the lead pair turn in stunning performances and the delicate and sensitive handling of the transgender story is what lifts this from being a pure Oscar bait to being a believable and emphatic story. 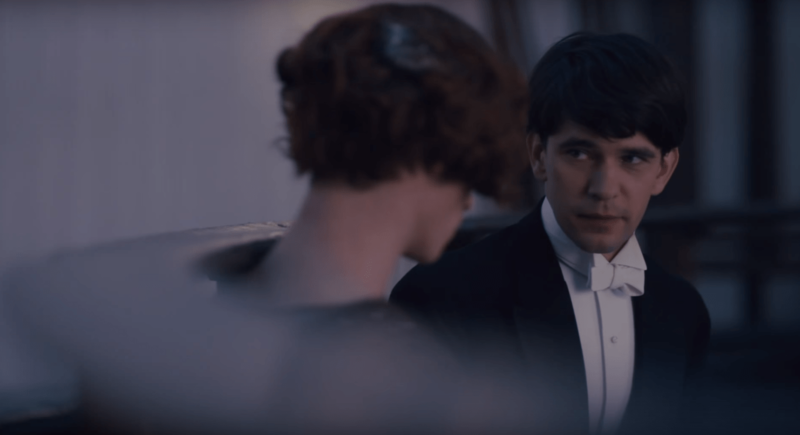 Do not miss The Danish Girl.